But it's a meal that Jesus would have simply called "the Passover." 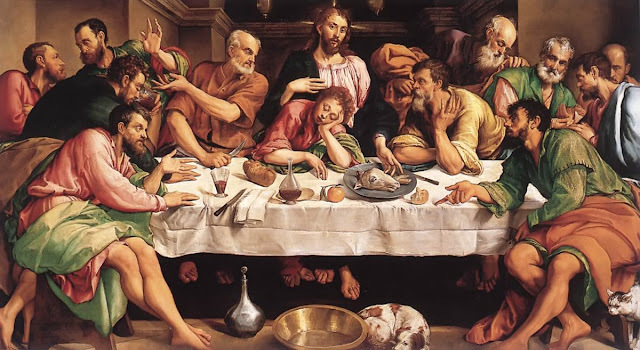 So there I was on Saturday night standing around a table, because the Passover was originally celebrated standing, and I haven’t eaten in 48 hours and I’m just dying for a good hamburger or some lasagna but what I saw on the table was all kinds of funny looking and funny smelling foods. The host filled all of our glasses with wine and we passed around several foods that were symbolic of our slavery. We dipped parsley in salt water to remind us of our sorrow and tears. We scooped enough horseradish onto unleavened bread that it brought tears to our eyes, like the tears our forefathers cried in Egypt, we ate this kind of apple sauce with raisins that was reminiscent of the mortar with which we built. And I’ll be honest by this point, my inner biblical history nerd had emerged and I was really getting into it. Well, I made it through the night and despite the mishap, honestly, the whole experience made me curious about the significance of these ritual cups of wine. In the next post, I'll tell you about the first one, and then another each post to follow.